This week we have the Tag Heuer Connected Modular 45, Samsung Galaxy Tab S3, Jaguar I-PACE and more. 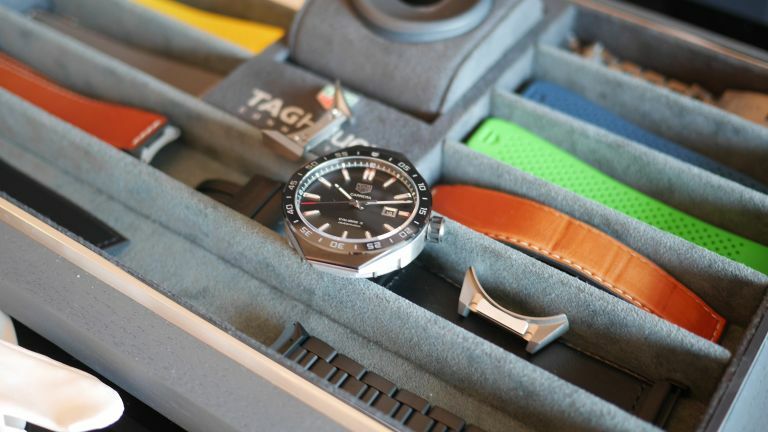 This week Swiss watchmaker Tag Heuer took the wraps off its latest Android smartwatch dubbed the Connected Modular 45. This watch, as the name suggests, is modular meaning you can make it work how you want with over 4000 unique configurations. The build is luxurious, as you’d expect, plus it’s plenty smart with an Intel processor, GPS and Android Wear 2.0. Check out the full details at the link below. Samsung has revealed the UK price for its top-end Galaxy Tab S3 tablet this week. To cut to the chase, it’s £600. Not cheap. But that’s justified. You get a stunning 9.7-inch Super AMOLED screen with eye-watering 2048 x 1536 resolution, new super sensitive S Pen, Snapdragon 820 CPU with 4GB of RAM plus 13-megapixel and 5-megapixel cameras. Check out more at the link. Jaguar has shown off its all electric I-PACE car by driving it on the roads of London. The first electric car from the sports motor manufacturer has a 500km range and 0-60mph time of four seconds. The final model won’t be with us until 2018 but expect more details to get revealed later this year. For now read all there is to know right now via the link here. The future of clothing is smart, if Levis has anything to do with it. The clothing company teamed up with Google to create the Commuter Trucker Jacket which smart connects to your phone. The result is an ability to control music, directions and more using the touch sensitive sleeve of the jacket - ideal for riding then. Check out details at the link. Castrol EDGE has teamed up with VR specialist UNIT9 to create a bespoke augmented reality headset that truly gamifies driving. The headset was worn by a Fast & Furious stunt driver while driving a Jaguar F-TYPE 5.0 Supercharged sports car. Virtual tanks, helicopters, nuclear submarines and more appeared around her while driving. Virtual ice shattered and explosions went off all around the driver thanks to the smart headset. While this could make for a really entertaining new type of theme park experience we're excited about headsets like this making heads-up displays in cars a proper reality. Imagine driving on the roads and having the actual road light up blue to show your navigation route. We can't wait - maybe keep the virtual tanks to off-road only though.